I took the bobbin out and the tension still seems correct on it, it's a new needle which is correct for the thread and everything is threaded right...Ideas? I had the same problem yesterday and it was so frustrating having to remove all those stitches, more than once I might add. My problem was the top tension. I know that the manual says you should first get the bobbin tension set and as a result you really shouldn't have to mess around to much with the top but I have never done that, luckily for me I usually get it to work. I was having eye lashing and I get so upset when I find that. Good luck I hope you get this resolved! Perhaps try a different bobbin and a new needle? I’m sorry, I wish I had better advice, but I feel your pain! Tension is so frustrating, I know why they call it “tension” ! I can’t wait to see what you’re working on! It looks like your bobbin tension is too loose, or the top is too tight. If you can't balance them, sometimes the check spring has to be replaced. I discovered that I have to loosen the upper tension a lot more than I would have thought on the midarm. About three turns. Now it works perfectly. I can get different threads to balance on my little Bernina. But on my longarm, I just always use the same thread on top and bottom. 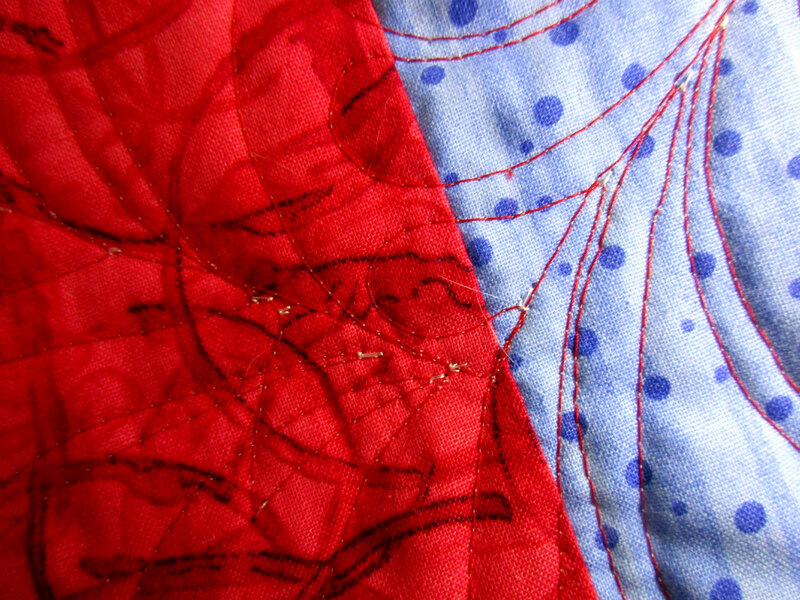 My Bernina repair man told me, to wind the bobbin one more loop around the post before it gets wrapped onto the bobbin, and that really solved my problem....my stitching looked very much like yours - I found anytime I have issues with tension - I first rethread the top of the machine, and find the machine doesn't like the fabric or the top and bottom threads don't work together well. I have started using "Glide thread" and have no more issues. You might need to re-insert your needle, it has to be directly south and north or depending on which way it threads east and west. I purchased a long thin beading needle and put it thru the needle eye to ensure mine is straight on the machine, this was causing me problems with tension on my long arm. Just another suggestion. Leah Day has a great video tutorial on tension on a mid arm, her q'pique but it would apply to any machine. She goes step by step through all the threading and places the tension could go amiss. I found it helpful for my domestic machine. This was a huge problem for me until I got the digital readout for my upper tension. I'd get mixed up and turn the wrong way, or not turn enough and it seemed like it would take me 30 mn or more of fussing before I'd get anywhere close to were I needed to be. And now I know what number I need to start at for the different thread types, and then do minor adjusting from there.